A few weeks back, I was able to meet with the owners of a coffee shop/restaurant called Sumo Dog in Lavender, Singapore. Sumo Dog specializes in Japanese dishes, especially in hot dogs on buns, and thus their logo. The owners, Aubrey and Nora, were very approachable and quite hands-on about everything about the business, and I love that about them. Eventually, we discussed doing a couple of boards to feature their newer in-store offerings, which are the ice-blended coffee and beers. For this commissioned work, we agreed to do 2 boards (well, one board with 2 sides) to be placed outside the shop to promote to potential customers in the vicinity and to maximize the foot traffic around the corner of the shop. We discussed the vibe and the look that they envisioned and they allowed me free reign to design the boards. Apart from specifying the words, the only request was that there should be an illustration of the cup/bottle. Over the following week, I did some mockups on iPad to show them before I do the actual piece. More details below. There's also a process video that shows the whole process from cleaning up to the final mark at the end of this case study. For the first board, which focused on the ice-blended coffee, the words 'Feeling Hot' and 'Drink Ice Blended Coffee' were suggested, and there were 3 drinks to feature: Mocha, Caramel, and Cookies and Cream. I decided to go for a simple stacked layout. I also wanted to show the following elements to emphasize that it's about drinks on a hot sunny day: illustrated cup with a straw, sun rays, and give each flavor their own individuality. 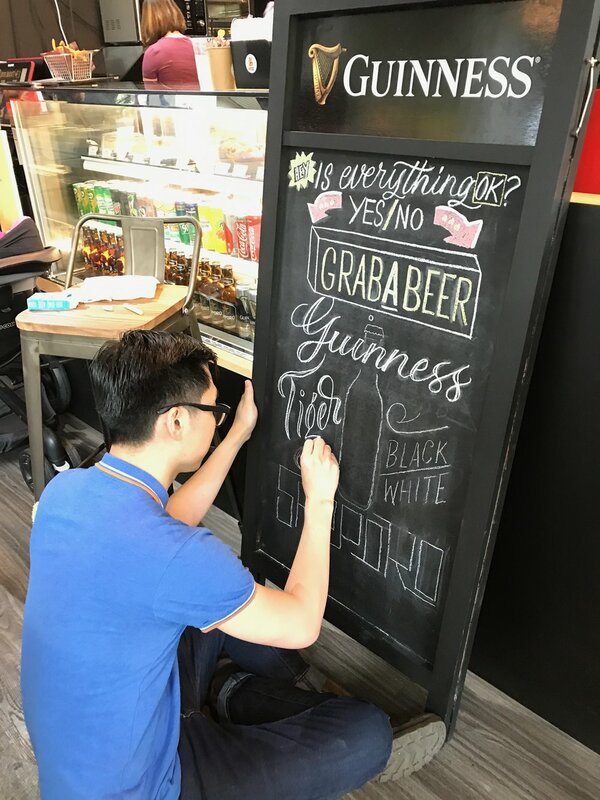 For the second board, which was focused on their beer selection, there were 4 brands to be featured: Erdinger, Sapporo, Tiger (Black & White), and Guinness. The words 'Feeling Hot' and 'Have a Beer' were suggested as the intro. My thoughts on the design were to fill the board with different styles. My goal was to make an impact on the people walking by. And I decided to go for a playful take on showcasing the beers. There definitely has to be a bottle at the center, and I decided to surround it with the brands they wanted to showcase. Here's a video that shows the process from start to finish - from erasing the board, to creating grid lines, drawing the layout, and slowly working on the elements. Overall, it was a really fun experience, and I am glad that they loved the result. I will be sharing more on the drafting process on Procreate soon.